SOGEBRAS | SOGEBRAS intervient dans les métiers liés aux opérations portuaires, au transport maritime et à la logistique. 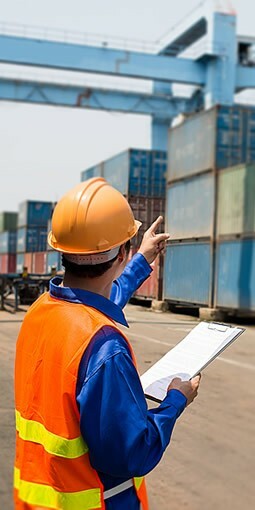 As approved customs clearing agent, SOGEBRAS deals with all the operational and administrative formalities required to clear all types of products trough customs and in accordance with all customs procedures. SOGEBRAS, agent of MARFRET line and agent of Rickmers lines for France. SOGEBRAS offers a complete ship agency service available 24 hours a day all year round. As a leading stevedore specialist, SOGEBRAS has developed solutions to meet the specific handling requirements of our clients. 45 000 m² of storage facilities, spread over 2 sites (39 000 m² in Nantes Cheviré and 6 000 m² in Montoir) with a logistic platform in the container terminal in Montoir de Bretagne. Located in the ports of Nantes St Nazaire/Montoir, SOGEBRAS is involved in all aspects of port operations, sea transportation and logistics.